Duke University is teaching monkeys how to move stuff with their minds. Back in 2000, they had monkeys using implants to move robot arms. Now, it's just the brain power of monkeys moving stuff. The idea, they say, is to eventually have prosthetics being controlled by mind power. Which is pretty cool. But, I'm thinking that's just the beginning. We're already to the point where monkey mind power could come up with a Website better than the Obamacare site. Heck, a Jedi Mind Monkey could do a better job as president than the jackass currently in the Oval Office. But, while replacing Obama with a Jedi Monkey might be an improvement, that only means a job for one of them. What about the rest of the Jedi Monkeys? What will they be doing? I'm not sure I like the idea of a bunch of monkeys that can move things with their minds running around. Monkeys can get bored. Remember, monkeys will bite people. A monkey will eat your face. One even shot Frank J. one time. We need to be careful. Just because you can teach a monkey to move stuff with its mind doesn't mean you should. Well, one, maybe. To take Obama's place. It'd be worth the risk. Teenage Mutant Jedi Monkeys. Gasshhh!. So if I notice poo flying all around for no apparent reason, I am to assume one of them Jedi monkeys is nearby? The next thing you know, they'll teach monkeys and apes how to play baseball. Wait. We already have that: The Chicago Cubs. "These are not the bananas you are looking for..."
The Obama presidency is just a conspiracy to get you to believe that a monkey could do a better job as president. The last 6 years now make a lot more sense when you understand it is all a monkey conspiracy. ... I'm going to have to go underground for a while now. A monkey will eat your face. One even shot Frank J. one time. OK, somebody has to play Diction Cop. Frank J. was shot by a chimpanzee, which is an ape, not a monkey. 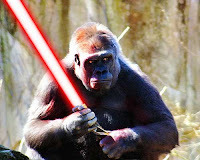 The "Jedi Monkey" pictured is also an ape. Apes and monkeys are all priimates; we are primates (with an apology to strict contructionist bitter-Bible-clingers. We RCs are less literal). All monkeys are primates, but not all primates are monkeys. Let's keep our d@mned dirty apes clear, here.